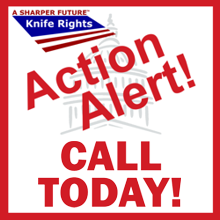 March 27, 2017: Knife Rights' Michigan Switchblade Ban Repeal bill, SB 245, has been scheduled for a hearing in the Senate Judiciary Committee on Tuesday, March 28, at 3 PM. SB 245 would repeal Michigan's outright ban on possession and sale of automatic (switchblade) knives. Since the sponsor of the bill, Senator Rick Jones, is also the Chairman of the Judiciary Committee, we are hopeful that the bill will pass. However it would still be helpful if those who live, work or travel to Michigan would call the committee members TODAY and POLITELY ask them to "please support SB245 when it is heard Tuesday." Keep it just that simple. 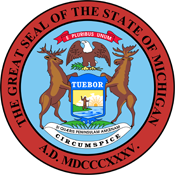 March 16, 2017: Knife Rights' Michigan Switchblade Ban Repeal bill, SB 245, has been introduced by Senator Rick Jones. The bill would repeal Michigan's outright ban on possession and sale of automatic (switchblade) knives, §750.226a (check the last paragraph of the bill). We will advise when it is time to contact your Legislators about this bill. Knife Rights has repealed switchblade bans in Alaska, Indiana, Kansas, Maine, Missouri, New Hampshire, Nevada, Oklahoma, Tennessee, Texas and Wisconsin. Colorado's switchblade ban repeal bill has been passed by the legislature and is awaiting action by the governor.